It was always our intention for this house to have the smallest impact on the site as possible, and that includes how the house sits on the ground. After spending the past 35 years living in a house with a basement that leaked Mom and Dad were determined to avoid this problem in their new home. As part of the desire to minimize the overall energy usage of the house we developed a passive-solar design that situated the house with a southern orientation, maximized south-facing glazing and minimized northern, and incorporated a thermal mass for storing thermal energy gained from the sun over the course of the day. 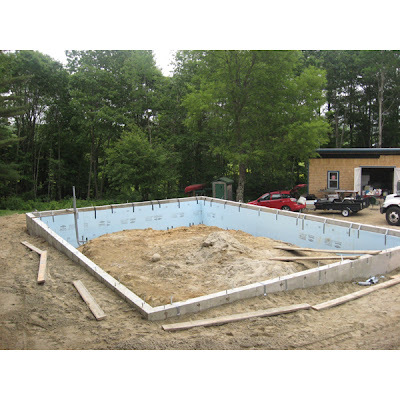 The most effective way to do this (and to avoid the potential problems of a wet basement) would be to build a slab-on-grade. Since we intended to use the floor slab as a thermal mass for storing heat gained from the sun it also made sense to incorporate radiant in-floor heat and use the slab as the primary heat source of the home. 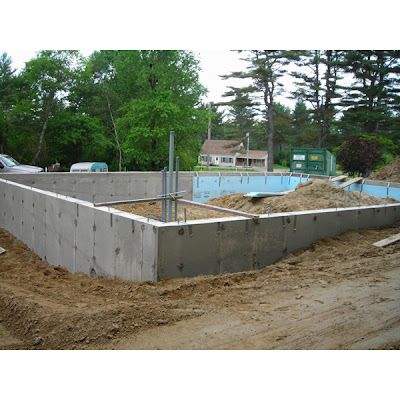 We were also interested in minimizing the overall amount of concrete used in the home, another reason for avoiding a full basement. Even though the Dragon Cement plant is less than 10 miles away from the site we still had concerns about the high embodied energy in concrete. This article addresses the carbon-load and energy intensity of producing and transporting concrete. Although the amount of concrete we saved by not building a full basement is insignificant in global terms it was still important to us to minimize the carbon footprint of this home. For the sake of simplicity we initially considered several monolithic slab techniques, but since the slab was to be the primary heat source for the home it made sense to isolate the slab from the foundation wall. 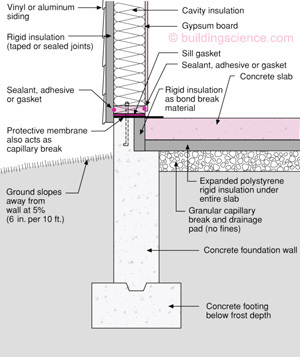 The problem with a typical monolithic slab is getting enough insulation around the outside of the slab to keep the heat you pump into it in a radiant application from escaping to the cold outside during the winter. 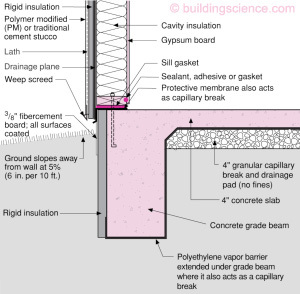 The detail below shows a wall construction with an R-value of somewhere between R-21 and R-30 depending on the insulating materials and thicknesses used, but around the foundation there isn't even R-10. 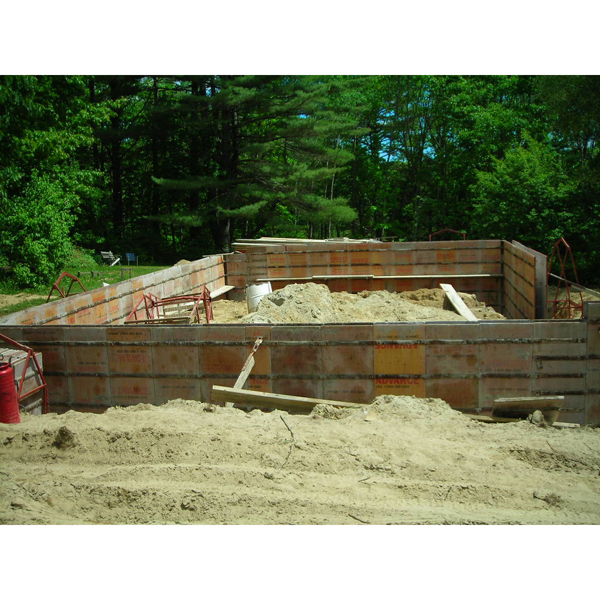 Since the framed wall needs to sit on top of the foundation it's nearly impossible to get adequate insulation in place if your monolithic slab is also your heat source. Additionally, because the slab is continuous with the wall in this detail the wall becomes part of the thermal mass being heated by the radiant floor system. While we want to have a substantial thermal mass it's possible to have too much mass to heat efficiently, and in this type of detail there is a high surface area relative to the mass which would lead to greater potential for heat loss to the earth below (not to mention the fact that this particular detail doesn't illustrate any insulation below the slab). 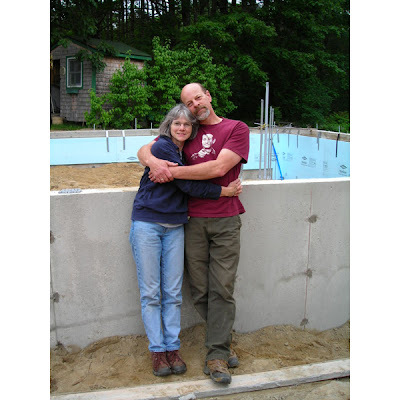 The detail we ended up going with is a modification of the one below, a more traditional foundation wall with separate footing, foundation wall, and most importantly a thermal break between the floor slab and the foundation wall. 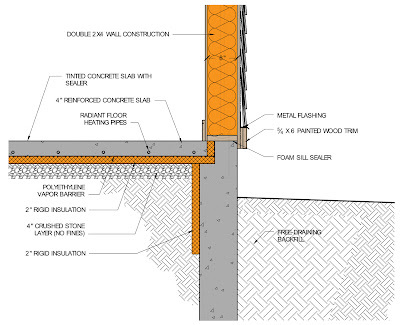 While both of these details illustrated have the same amount of insulation between the slab and the outside air, the placement of that insulation makes all the difference. 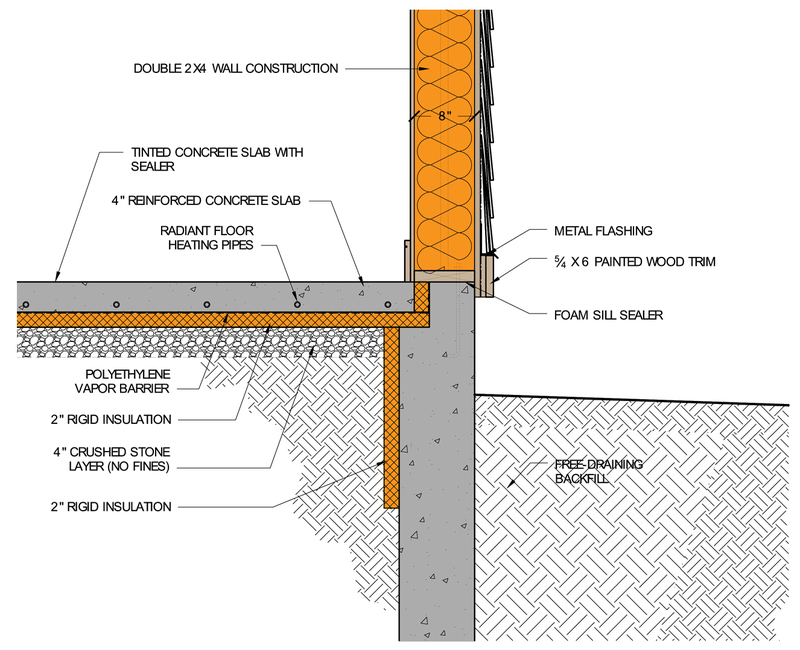 The detail below is the one we developed, which also includes a layer of 2" rigid insulation extended down the inside face of the foundation wall to help prevent frost from penetrating to below the floor slab. At one point we considered insulation on the outside of the foundation wall but ultimately abandoned this out of concern for the durability of a finish over the insulation. The soil on site was very sandy which made for quick excavation for the foundation wall. The photo below shows the footing form-work with a step down towards the front of the house where grade slopes away. 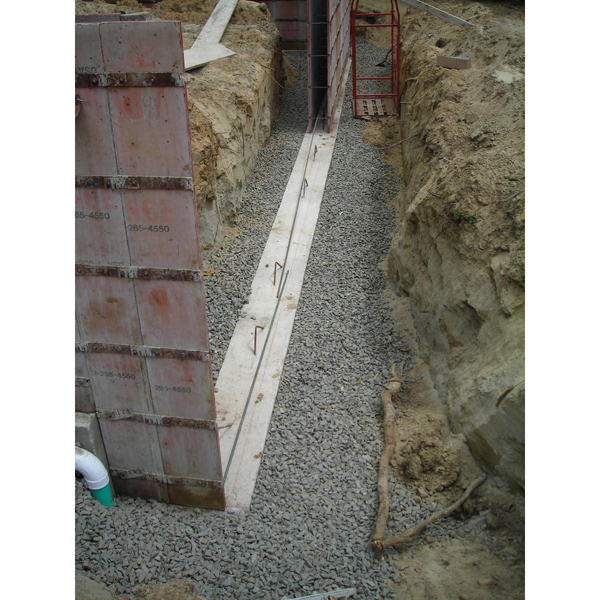 Below shows crushed stone backfill around the footings. You can also see the perimeter drain in the lower left corner of the photo below where the footing steps. 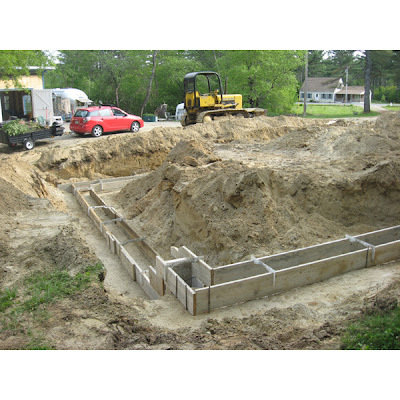 Even without a basement it is important to drain water away from the building foundation due to concrete's ability to wick moisture. 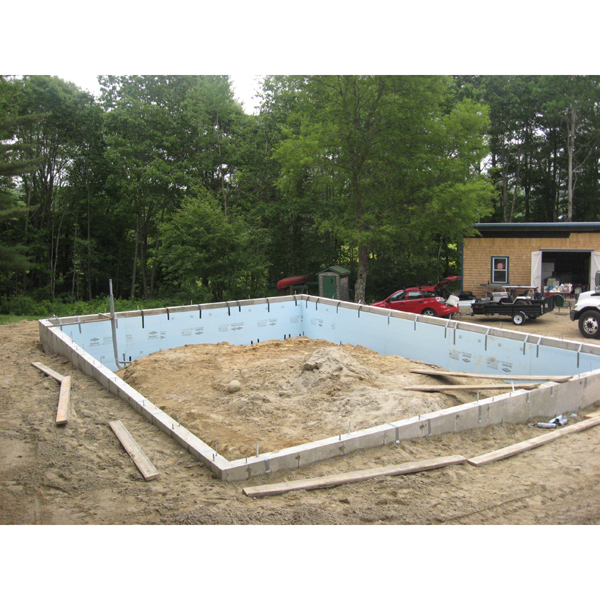 The completed foundation walls with partial backfill and the beginning of insulating to the interior side of the wall. Without having a basement in the house there was definitely some concern about storage space which it why it was great to have completed the detached workshop building before construction began on the house. The workshop provided a perfect staging area for the contractor and ultimately the storage space that Mom and Dad needed. Not having a basement also meant that all the mechanical systems of the house would be on the same level as the living area, where space within the 1120 square foot footprint was at a premium. 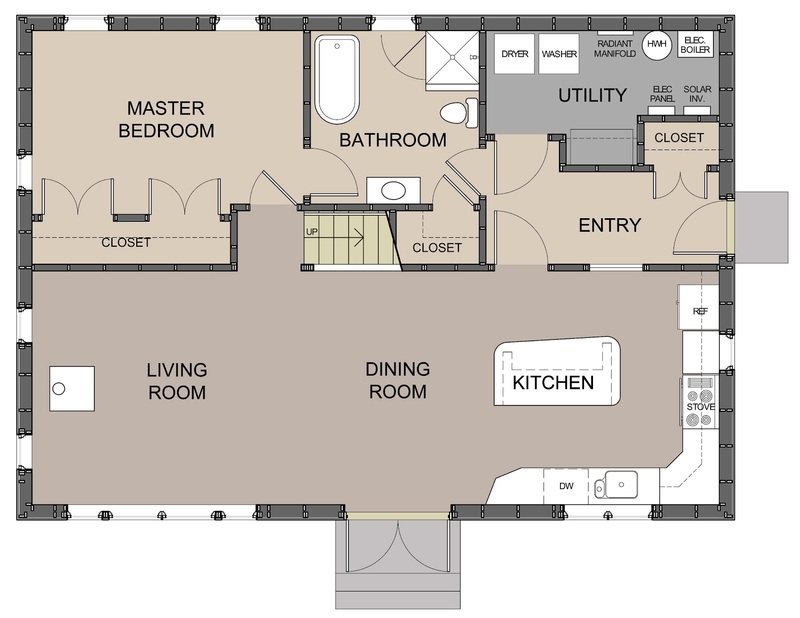 We managed to squeeze the boiler, water heater, radiant manifold, electric panel and solar inverter, washer, dryer and freezer into a 78 square foot utility room.